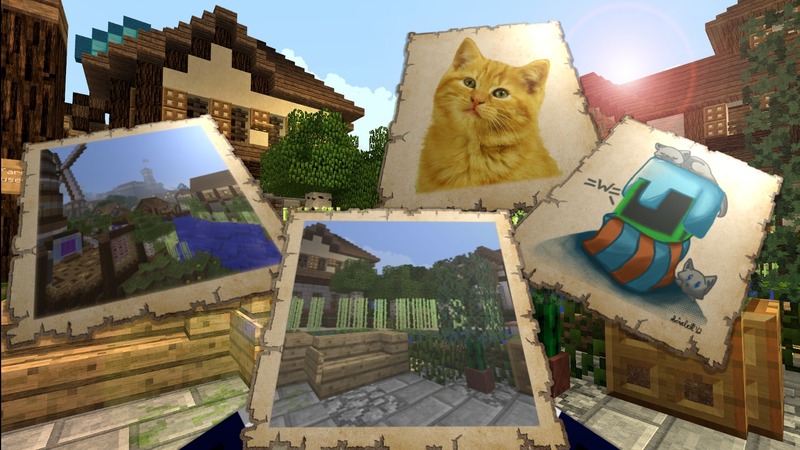 With Photos, you can import any image from the internet into the game, so it is visible to you and anyone else on a map. Photos can be viewed by holding the item, or by putting them on a wall for display. Creating photos is an opportunity to customize your build in a more personal way than the game would otherwise allow you. /photo – Open the photo menu which allows you to view and purchase more copies of your photos. /photo name [name] – Create a photo with the given name. /photo load [url] – Load a photo from the Internet onto the map in your hand. /photo color [color] – Change the color of the photo. Photos are simple to use. There is one command: /photo, which will show you the main Photos menu. From this menu, you can purchase blank photos for 1,000 coins. For every blank photo, you can create one named photo, onto which you can then load an image from a URL. Here are the steps. View photo options at any time by right-clicking with one in hand. Something to keep in mind is that you have to supply the actual image link as the URL. If it doesn’t end on “.jpg” or “.png”, chances are that it is not a valid image and the loading won’t work. Another consideration is that some sites will deny the download attempt since it doesn’t come from a web browser. Your best bet is to reupload it to another site that does allow this. We recommend Imgur. You can load another picture on the same photo if you change your mind later on. Just keep in mind that every existing copy of your photo will also change. Lastly, photos always have a resolution of 128 x 128 pixels. If the imported photo is not of the same dimensions, it will be resized, so it is recommended to crop it into the right shape beforehand to avoid distortion. You can use applications such as Paint or Gimp to do so. No offensive or provocative pictures. No images which are “not safe for work”. No advertising of anything outside of this server.